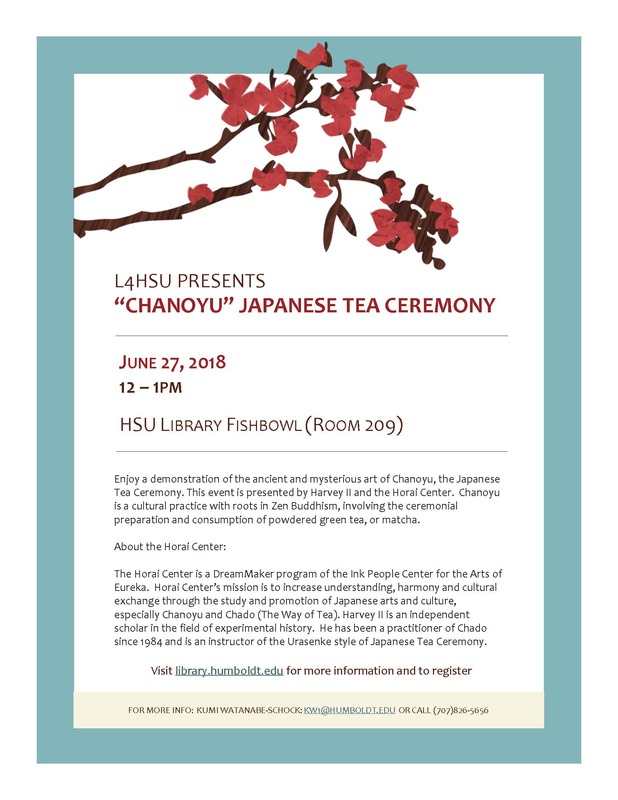 Enjoy a demonstration of the ancient and mysterious art of Chanoyu, the Japanese Tea Ceremony, and learn about the Eureka-Kamisu Sister City association, presented by Harvey II and the Horai Center, Wednesday, June 27, from 12-1pm in the Library Fishbowl. Limited seating is available, so register now! Cha-no-yu, is a cultural practice with roots in Zen Buddhism, involving the ceremonial preparation and consumption of powdered green tea, or matcha. The Horai Center is a DreamMaker program of the Ink People Center for the Arts of Eureka, Calif. Our mission is to to increase understanding, harmony and cultural exchange through the study and promotion of Japanese arts and culture, especially Cha-no-yu (the Tea Ceremony) and Chado (The Way of Tea). The Horai Center is also involved in promoting the Eureka-Kamisu Sister City association. This relationship was originally founded in 1991 with the port city of Kamisu on Japan's east coast and offers an opportunity for the two cities to gain valuable benefits through exchanges of art, culture, education, and commerce. Harvey II is an independent scholar in the field of experimental history. He has been a practitioner of Chado since 1984. He is an instructor of the Urasenke style of Japanese Tea Ceremony.